Third Thursday Demo – October 16, 12:30 p.m. - TOMORROW! 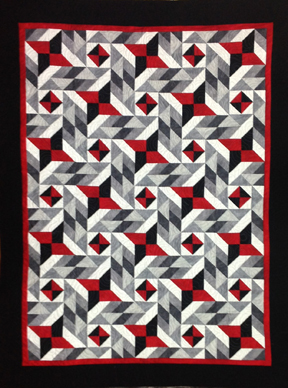 Karen just finished this shop sample using the Creative Grids Cottage Ruler. This unique ruler makes cutting half-square triangles, quarter-square triangles, parallelograms, and trapezoids so easy. Join us for a short demo and then try out this fun tool for yourself. You’ll be amazed by what can be done with one little ruler. Third Thursday Demos are always free. Quilt ‘Til You Wilt – Friday, October 24, 5 – 10 p.m.
Join us for another evening of sewing at Quilt ‘Til You Wilt on October 24. Bring a project, pack your dinner (or order out from a nearby restaurant), and get ready to have fun with old friends and meet some new ones. Beverages provided and we’ll have a few door prizes! Please RSVP as space is limited. There are a few spaces available in this class on Friday. News flash . . . selvages are not wasted fabric! Not, that is, if you know how to use them. Start gathering up your selvages now and sign up to attend this class where you’ll make a darling zipper purse. Don’t know how to put in a zipper? Consider learning that technique an added bonus! You’ll also learn how to make a French seam on the inside of the purse. Cyndi Foote will teach this class and will bring some of her own selvages to contribute for students who don’t have quite enough in their stash. 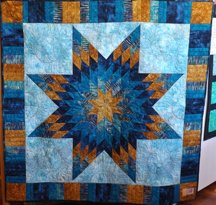 Have you always wanted to make a Lone Star quilt? Well, good news! Use a QuiltSmart pattern with pre-printed fusible interfacing and you'll be amazed by how easy this comes together. We have both in stock.